Welcome to PRIMEDEC DECORATORS Knebworth! PRIMEDEC DECORATORS are a friendly, Reliable family run professional painting and decorating business with over 30 years experience,We are based in knebworth Hertfordshire and cover all the surrounding areas including bedfordshire.Using primedec decorators you are assured of very high quality professional craftsmanship for all your painting and decorating needs, All of which is fully guaranteed on completion. We provide first class finishes at affordable prices. Primedec decorators provide detailed written quotations based on the clients requirements to ensure there are no misunderstandings and all the work undertaken is fully insured. 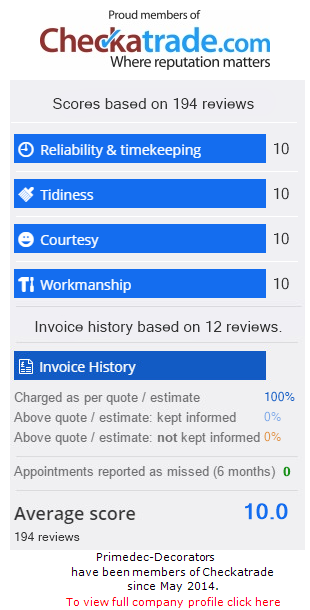 Reputation is important to primedec, We listen carefully to our clients and by working closely with them we can guarantee customer satisfaction. We undertake interior & exterior painting and decorating and apply all wallcoverings. No job is to large or small, From one small room to full Interior decoration of your property. CONTACT US TODAY FOR A FREE, NO OBLIGATION ESTIMATE ON 07876 730 912.